This brass PE fret comes in a sealed cello bag with card at the top with a hole in it to allow the product to be displayed on a hook at a hobby shop. The fret is on a stiff black card inside a further sealed cello bag in the other cello bag with the instructions. The instructions consist of a single sheet in 8 1/4" x 11 3/4" format printed on both sides and folded several times to fit the cello bag. The instructions show 9 assembly drawings that are not numbered. Platz's street address in Shizuoka City, Japan, it's telephone and FAX numbers are provided as well as its web address. The PE set is a cooperation between the two companies, because the fret has "Eduard 2017 & Made in Czech Republic" etched into the it. 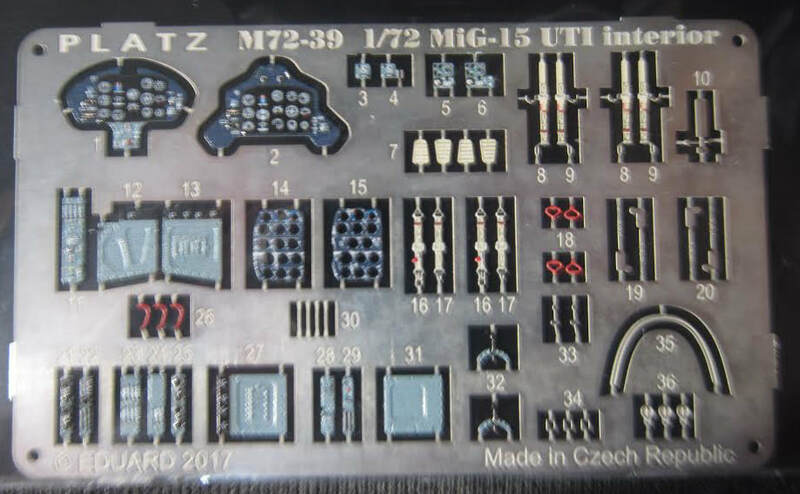 Some of these parts are very tiny and will take real delicate handling with a pair of pointed tweezers to place them on the Mig-15UTI model by Platz (reviewed elsewhere here). That is if you can even handle them at all. The smaller parts aren't much wider than a human hair. I had some other PE sets from Eastern Europe years ago that were over-egineered and had many microscopic parts that were impossible to pick up or glue to anything other than your fingers. The large parts are useful though. This is neat detail set for the Mig-15UTI and will really superdetail the kit.